A couple of days ago I posted on my Facebook wall: if you had the choice, would you draw a big fortification wall or would you dig a cistern. The answer was overwhelmingly the cistern, and I was already leaning that way as I’d never dug a cistern before, but I’ve drawn many walls. So yesterday we (me and Leith and Mohammad) started clearing out all of the surface debris that had fallen into the cistern. Lots of trash had either been blow into it or had been deposited on purpose and I wanted to clear it off so that I could get a better picture of the whole thing. 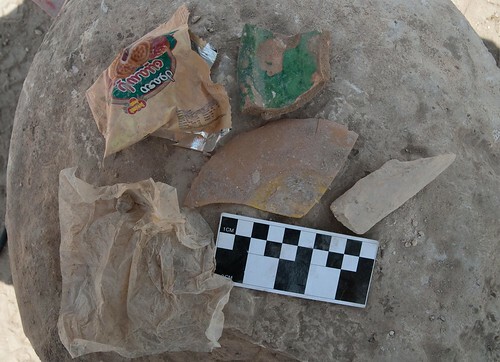 Here’s an assortment of the modern trash (and one Mamluk pot sherd) that I cleared out, a quickie shot for the contemporary archaeologists. Not shown are the many many black plastic bags that were tied shut with mysterious substances inside. I’m a curious girl, but not THAT curious. So we made it as tidy as possible and took a photo and I drew an overall plan of the thing that looks more like a Georgia O’Keefe drawing than a plan–I use the MoLAS drawing conventions and all the hachures indicating slope make it look like a big flower. Anyway, so that brought us through the first part of the day and I decided to tidy it up as much as possible so I could take an early morning shot before the sun hit the west side of the tell. On day two we decided where to section the cistern fill so that our geomorphologist would be able to ascertain the different episodes of collapse and fill. We are cutting it from north to south, not exactly in the middle, but close. After trying to figure out where the best place would be to enter and exit and where to haul out the gufaf, we started. More modern trash. A lot more. I found a weird metal wire and a garden hose and lots of potato chip wrappers. There were three or four of the same kind, was it someone’s favorite place to hang out while having an afternoon snack? I can’t really imagine, as the cistern sort of reeks of pee when the sun hits it just right. Did I mention that I have started to question the judgement of my lovely Facebook friends? We also ran into seven scorpions, three of which were black and as big as my hand. I usually try to run a peace-and-love trench with the minimum of killing small crawly things, but I let the workmen kill the akrab immediately while in the cistern. It’s just too confined of a space to successfully maneuver them out of the way. 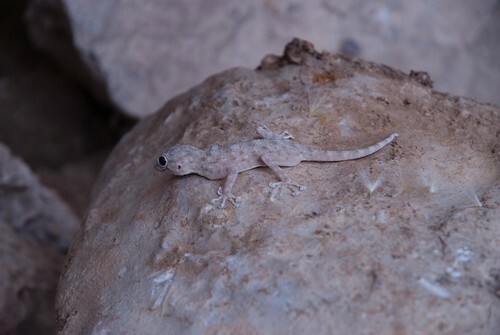 Not so with the huge, cool gecko that I found. My workmen were really keen on killing it and I had to physically put myself between them and the small creature. It was then that I found out that not killing them was haram. I mentally added it to my haram list next to singing and abusing cats, which are in the medium haram range–not heavily punished, but frowned upon. Sometimes. Anyway, I carried him away and put him safely in the rubble of an Umayyad trench. Later I tried to get an explanation about why not killing lizards was haram, but I didn’t really understand–something about Abraham and the lizard gathering sticks to help him burn? So, after .3m or so, we came upon a change in the color and texture of the dirt, our next layer of stratigraphy. Unfortunately, we had to haul out around 250 gufaf before this happened, with a line of three people: one person digging, the next person lifting the guffa up overhead, and the last person carrying it to the backdirt pile. 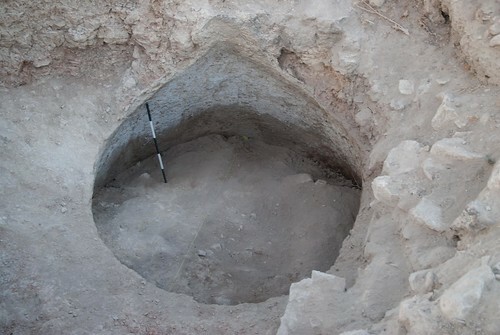 We didn’t sieve this layer, as we were still getting modern trash, and the hand picked assortment of pottery that I looked at was absolutely miscellaneous surface wash. We also had to lift a half dozen ashlars out of the trench–this is only going to get worse as the trench goes down. It is also hot in the cistern, and Leith, Mohammad and I were sweltering during a blazing, breezeless and oddly humid day. With some help from Dr. Bruce we finished clearing out the second context all the way to the soil change, so I can do a bit of drawing and get a photo tomorrow. I am also getting final photos of the walls in my last trench tomorrow, after which I’ll draw the elevations and the sections. I’ll probably post a rough draft of the trench report in the next couple of days, if I don’t drop dead at the bottom of a cistern. Or get clobbered by a falling goat. It could happen. For now though, I’m going to post this and prepare for my photo show, and hopefully watch Spain beat Holland tonight! Go Espania, I’m mostly rooting for you because all of the workmen on site like Spain! Haram, also the word in Hebrew for excomunication in the religious sense. Mmmmmm….. a mahmoul wrapper next to a piece of glazed Middle Islamic ware……both look yummy….